The Crombie was a traditional looking black or navy woollen knee length coat that was always worn with a red silk hanky in top pocket. 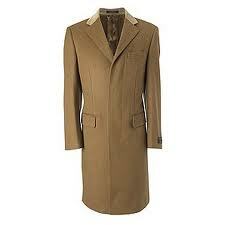 These iconic coats were worn by the same crowd making lots of noise with their blakies! (1972). The Crombie style coat became very popular in the 1970s with the skinhead brigade. These were smart and well-cut coats that were ideal for cold weather and when seen en masse, such as at the football matches of the 70s – it looked like an army was on the move. Despite the skinhead associations, the Crombie Company was a well-known respectable clothing business. Crombie was established in 1805 inScotlandand is one ofBritain’s oldest brands. They supplied clothing to the confederate army in the American Civil War as well as British officers uniforms in both the Second and the First World Wars. Of course, the skinheads would look great, especially when you consider that one of the other 1970s accessories was the famous Sta-press trousers. The skinheads who were raging against society norms, were actually wearing well know established brands. The skinhead fashion embraced the Crombie coat in the 70s and they were the “must have” clothing item of the era. The Mod revival during the 70s also favoured the style of the Crombie. Adaptable, stylish and warm these coats were hard wearing easy to wear and expensive. Mostly the coats were 3/4 length, and I always found them a little heavy for my slight frame. But I loved the look and style of the coats, and they did seem to keep their shape without having to send them to a dry cleaner. Of course, we could not afford dry cleaners anyway. Life was hard in the 70s!